The Standard Model, the sum total of centuries of physicists' work in attempting to understand the universe, remains an unfinished work, but nothing conclusively explains why particles have mass. 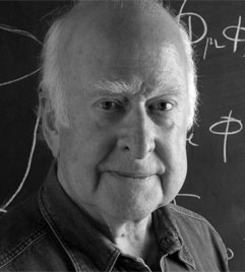 Something must generate the masses of particles, and one explanation was proposed by particle physicist Peter Higgs in 1964. Other physicists call it the Higgs field, while Higgs himself calls it "the so-called Higgs field" -- a theoretical area that permeates space and endows all elementary sub-atomic particles with mass through its interactions with them. In Standard Model physics, particles are associated with fields -- quarks and leptons make up matter, and vector bosons carry forces -- and the particle associated with the Higgs field is called the Higgs boson (Higgs calls it the scalar boson). Some physicists have gone so far as to describe the Higgs boson as a "God particle" that might lead to a unified "theory of everything". Among the skeptics, however, was Stephen Hawking, who placed wagers with other physicists betting that the Higgs boson would not be discovered during a long and expensive effort using the large electron positron particle accelerator at the CERN laboratories in Geneva. Hawking won that gamble in 2001, when the CERN effort ended without success, but most particle physicists remained confident that Higgs' idea would eventually be proven true, as it fits the Standard Model so perfectly. A new round of experiments at CERN discovered the Higgs boson in 2012 -- an anomaly in the data which suggests a particle weighing 125.3 gigaelectronvolts, much heavier than the mass of the average proton. At age 83, Higgs was invited to the press conference announcing the discovery, and told reporters, "I never expected this to happen in my lifetime and shall be asking my family to put some champagne in the fridge." In 2013 he was awarded the Nobel Prize.